Why was Herod and all Jerusalem Disturbed when the Wise Men Arrived Looking for One Born King of the Jews? This article explores the reasons why Herod and all of Jerusalem would have been disturbed. Wise Men (Magi) Arrived Looking for One Born King of the Jews? In 2007, Aryeh Kasher, Ph.D. (an expert in Jewish history during Herod’s reign) collaborated with psychiatrist, Eliezer Witztum, M.D. (a senior staff psychiatrist) to develop a psychological portrait of Herod the Great based on the facts recorded by historians. Herod’s psychological portrait goes a long way in explaining why he and all of Jerusalem were so troubled when wise men from the east arrived in Jerusalem looking for one born king of the Jews. Given Herod’s documented paranoia about people conspiring against him, there is no reasonable doubt that Herod would been very disturbed by the news that another “king of the Jews” had been born. Why was All of Jerusalem Disturbed? Even Herod’s favored firstborn son, Antipater (the destined heir to Herod’s throne), was charged with plotting against his father and executed just five days before Herod died. By the time the wise men (Magi) arrived in Jerusalem, Herod had ruled over the Jews for about 30 years and had developed a reputation as a murderer and barbaric tyrant. The above provides sufficient reason for the Jews to be disturbed when the Magi arrived announcing that a “king of the Jews” had been born as reported in Matthew 2:1-3. The wise men (Magi) referenced in Matthew 2 are believed to have been from Persia which included Babylon and was part of the Parthian Empire. In addition to being well-educated pseudo-scientists who practiced astronomy, some scholars believe the Magi were members of the Parthian government (more). This is the view of Barry Setterfield (a proponent of the Jupiter proposal for the Christmas “star” — aster more). As presented by Setterfield, because the Magi (or, Magoi as Setterfield instructs) were representatives of the Parthian government, they would have had a large entourage of armed men (perhaps even members of the Parthian cavalry) accompanying them on their 700-1000 mile journey to Jerusalem. [See, Barry Setterfield, The Christmas Star (2008)] . 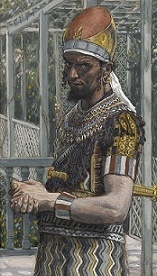 The arrival of a large entourage of Parthian armed men in Jerusalem may have been especially alarming because just 30 to 35 years earlier, Antigonus(the last Hasmonean king of Judea and an ally of the Parthian Empire) had been executed by Rome which is what lead to Herod being instituted as Rome’s client king in Judea. Accordingly, it seems that Herod and the people of Jerusalem had reason to be concerned that Magi from the Parthian Empire (especially if accompanied by a large entourage of armed men) may have arrived with intentions to reclaim Judea as an ally of the Parthian Empire. As set forth above, good explanations exist as to why Herod and all of Jerusalem would have been disturbed when wise men from the east arrived saying they were looking for one born king of the Jews (Matt. 2:1-3). Accordingly, there is no substantial justification for skeptics insisting that Matthew’s account of the wise men be written off as mere fiction on that basis. Slideshow Photo: This is a cropped photograph of a 1886-1894 opaque water color painting over graphite on gray wove paper by the French artist James Tissot (1836-1902). The image was downloaded from www.wikimedia.org which states the image is in the public domain in the United States, and those countries with a copyright term of life of the author plus 100 years or less. In 2014, when the image was downloaded, the painting was located in the Brooklyn Museum in New York City as part of its European Art Collection. Herod the Great: The image was downloaded from www.wikimedia.org which states the image is in the public domain because it is a faithful photographic reproduction of a two-dimensional work of art in the public domain in the United States, and those countries with a copyright term of life of the author plus 100 years or less. Coin of Antigonus: Photographs of these coins were provided by Classical Numismatic Group, Inc. http://www.cngcoins.com. One side displays a double cornuacopiae tied at the base; the other side a wreath with upright tie ends. The image was downloaded from www.wikimedia.org which states the image is licensed under the Creative Commons Attribution-Share Alike 3.0 Unported license.